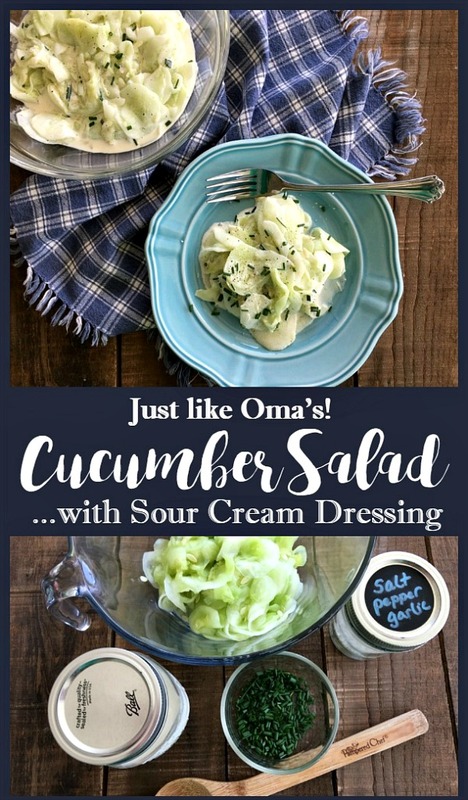 German Cucumber Salad with Sour Cream Dressing just like Oma's. 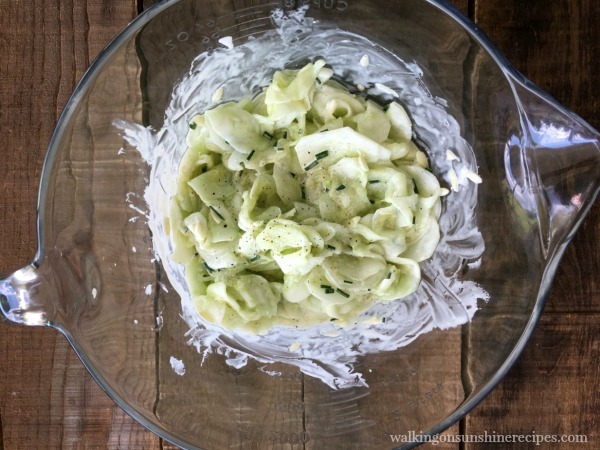 You are going to love this German Cucumber Salad with Sour Cream Dressing that taste just like I remember my Oma making when I was a child. 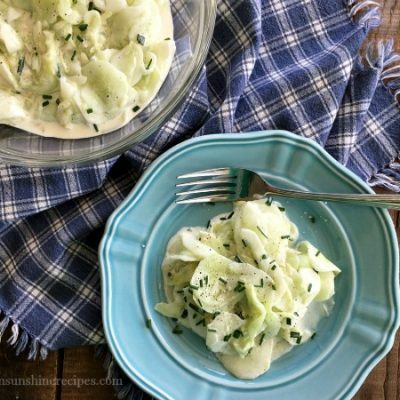 German Cucumber Salad with Sour Cream Dressing is the perfect salad to make with all the fresh cucumbers showing up in farmer’s markets, grocery stores and even your own garden. This salad brings back many memories for me because it’s very similar to the salad my grandmother, or Oma, made for us many years ago. My mother learned how to make the salad from Oma as well and now I make it for my family. Our garden has been exploding this summer! I guess it’s giving back two-fold since we didn’t plant a garden last year…well that’s what I like to think. Here’s a photo from just one day’s gathering. This photo doesn’t even show the jalapeno peppers, green beans or summer squash. Tomatoes are beginning to ripen and our pumpkins are coming along nicely too! Yes pumpkins! But now, let’s get back to the salad. I’ve made this a few times already for my family this summer. I even used cucumbers from the grocery store and the salad still came out amazing. 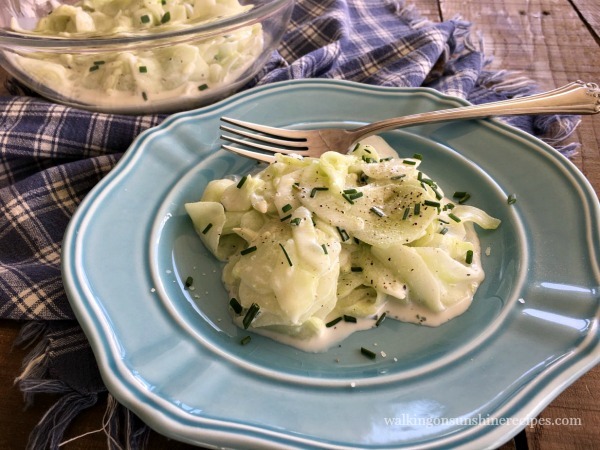 Cucumber Salad or, Gurkensalat in German, is a fresh and simple side dish featuring thinly sliced cucumbers in a sour cream and dill dressing…although I didn’t have any dill on hand yesterday when I made this salad. I use fresh chives from the garden and it is just as good. 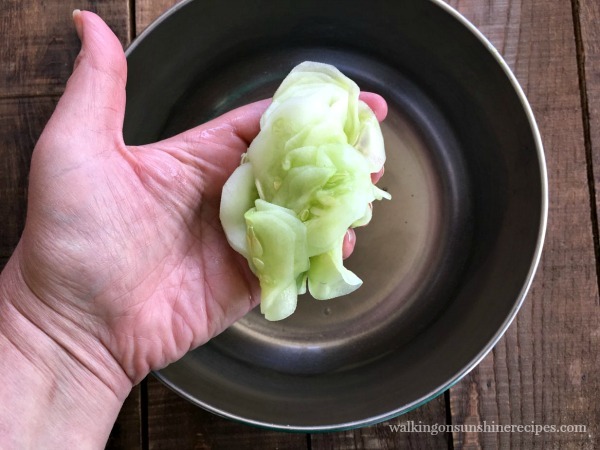 When I was looking at other recipes for this salad they all seem to skip the most important step that my Oma and my mother did…you need to salt the cucumbers and let them drain to remove the excess water. Do not skip this step! 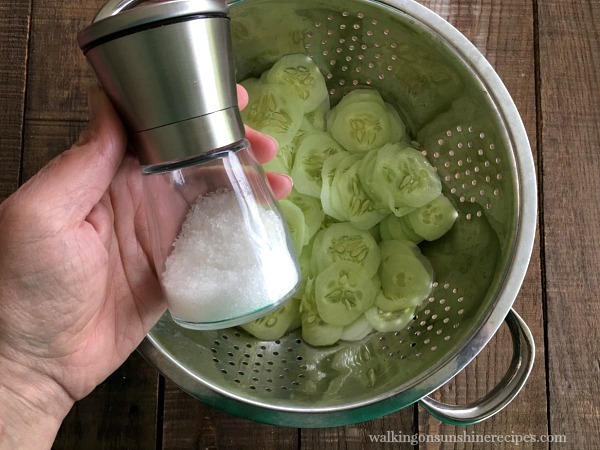 I’ve had other cucumber salad’s where they are watery and just don’t have the same taste as when you salt the cucumbers first. 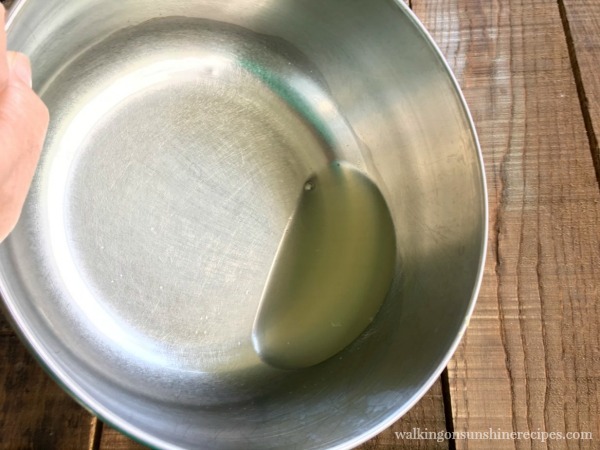 I include photos so you can see how easy it is to do this part of the recipe. 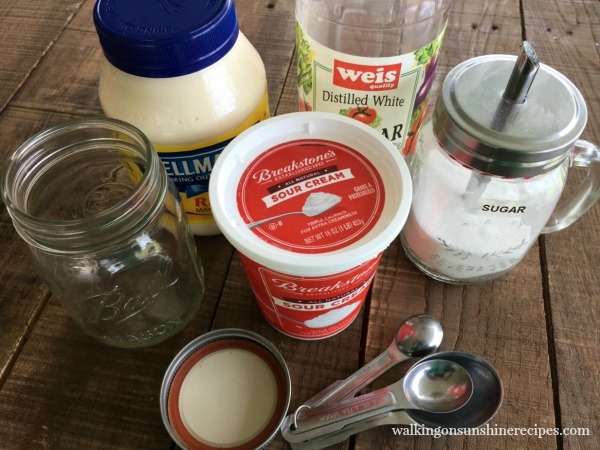 This sour cream dressing is amazing. 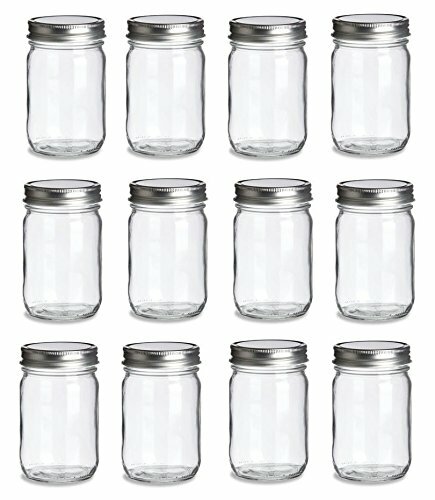 I like to double the recipe and store it in a mason jar. 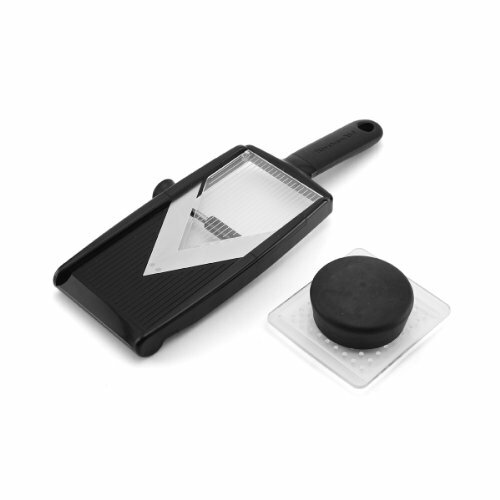 mandoline is the best tool to get your cucumbers really thin. 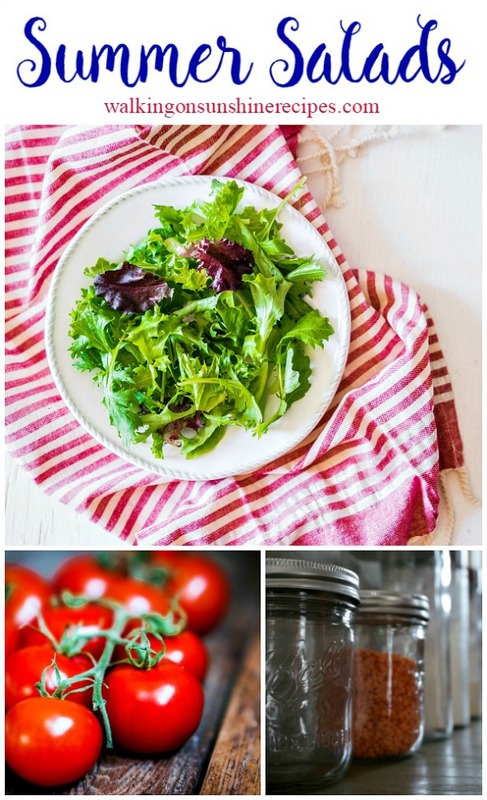 Make sure you check out my Shopping List at the bottom of this post for the kitchen tools I used to help make this salad. The cucumbers are so thin you really can see through them! Now, the most important step. 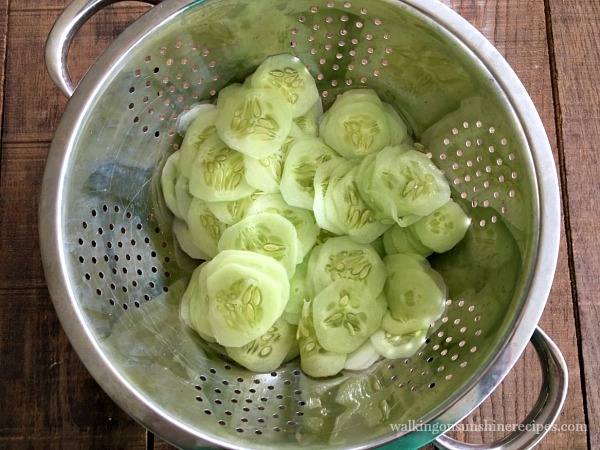 Place the cucumbers in a colander. Salt them. 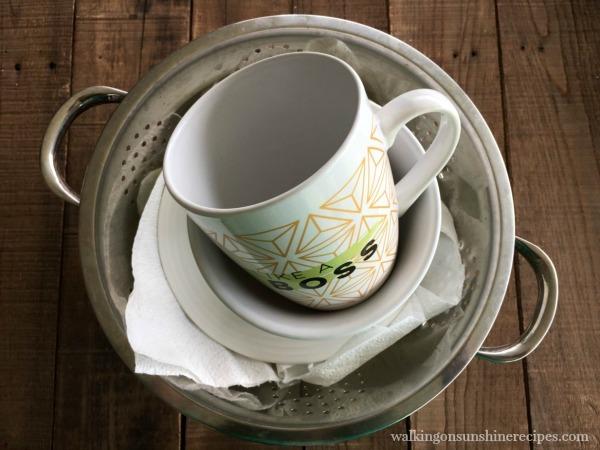 Be generous with the salt as you want to remove as much excess water as possible. If the cucumbers are extremely fresh, as mine are, you will be surprised how much water are in them. Cover them with a paper towel. And then weigh them down. 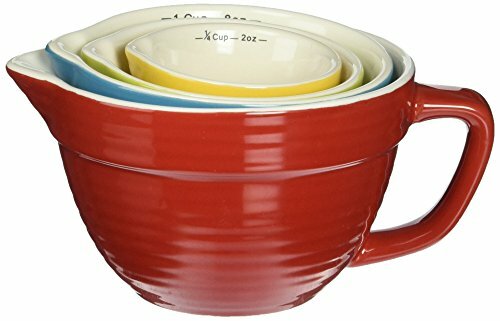 I like to use a plate, a bowl and a big mug. 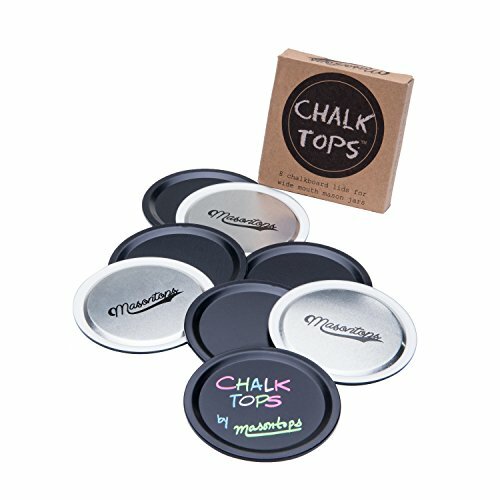 It doesn’t really matter what you use, just weigh them down because this will help push the water out. Let the cucumbers sit like this for an hour or so. You can leave it on the kitchen counter. Look at all that water! That would have ended up in your salad if you didn’t salt the cucumbers. But we’re not done yet. There’s still a ton of water in the cucumbers! 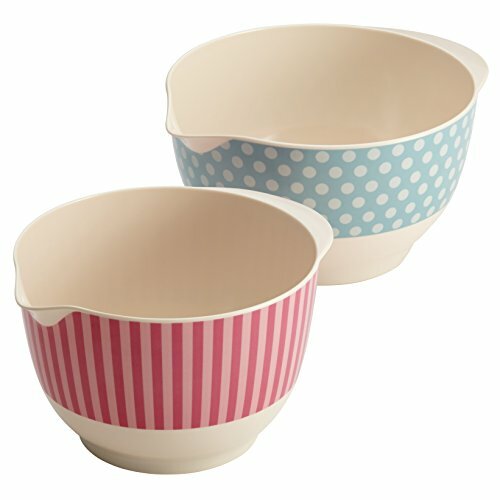 Take them in your hand and squeeze them over the same bowl. Go ahead, don’t be shy…squeeze the cucumbers dry! Now we’re ready to add the dressing. I love to use my House Seasoning but salt and pepper work great too. 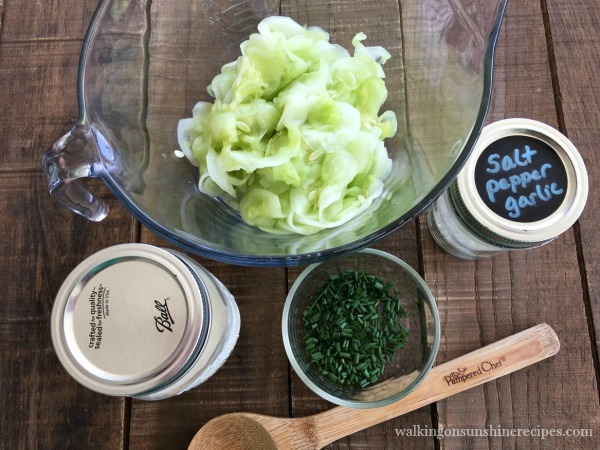 If you have dill, you can add one tablespoon dill in place of the chopped chives. I also like to add thinly sliced red onion sometimes too. 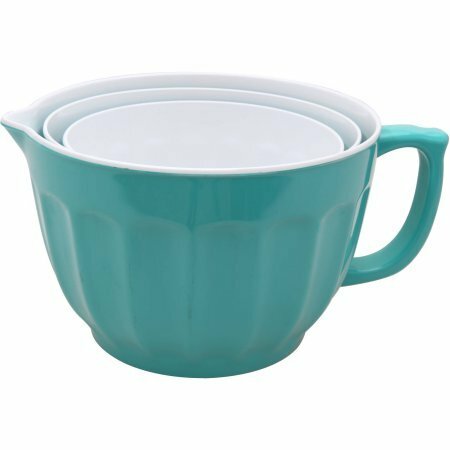 It’s not only great to use as a mixing bowl, but with the lid, you can store the salad in the refrigerator and keep it fresh. The salad is ready to enjoy…but, like with everything else in life, it does taste better after it’s been refrigerated for a few hours. But go ahead, taste it and see if you need more salt and pepper. Delicious. 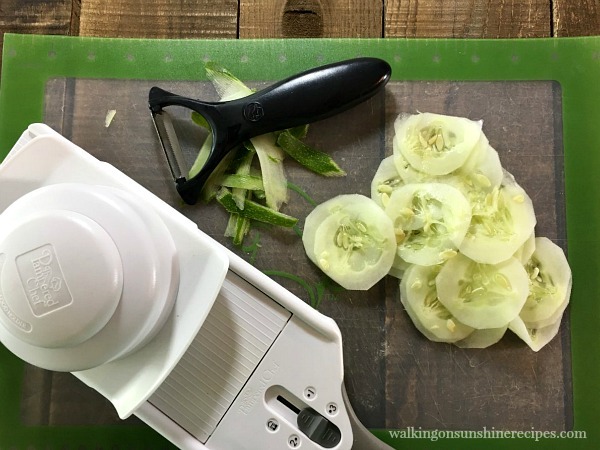 I love this cucumber salad and the memories it brings to me every time I make it. Just like my Oma used to make. You're going to love this easy recipe that's perfect for all the cucumbers growing in your garden this summer. 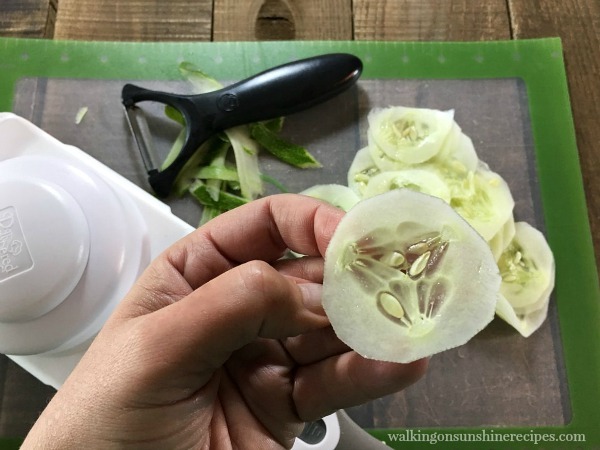 Peel the cucumbers if desired and thinly slice them with a mandoline slicer. The thinner the better! Place the cucumbers in a colander and salt them...generously. 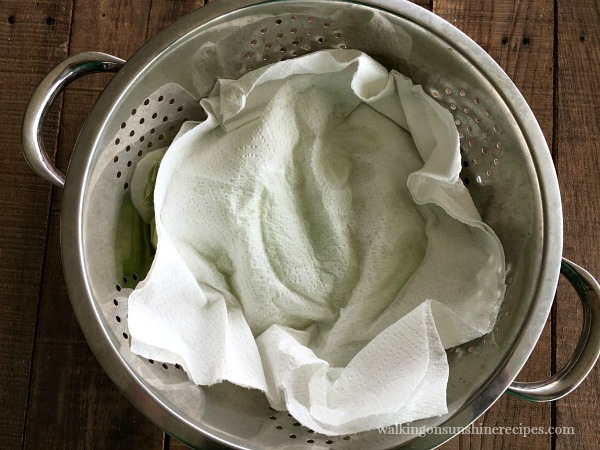 Cover the cucumbers with paper towel and place the colander over a bowl to allow the cucumbers to drain the excess water for at least 2 hours. 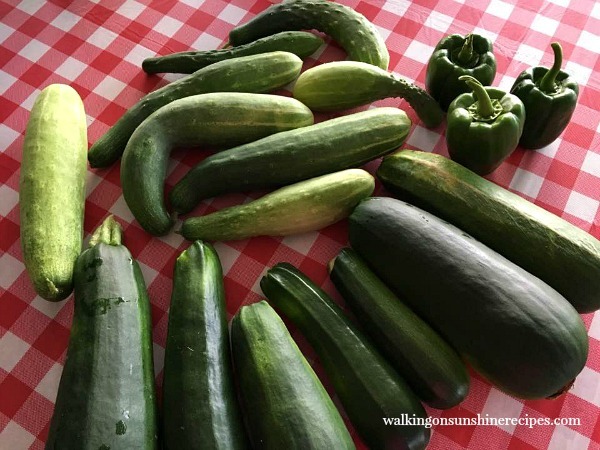 Squeeze the cucumbers to remove any excess water...you want them as dry as possible. Add the cucumbers to a bowl and prepare dressing. Combine all the ingredients for the dressing in a small bowl and then pour over the cucumbers. Toss gently to combine. 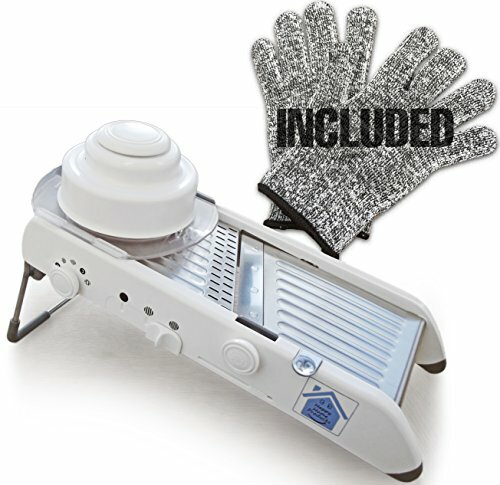 Cover and refrigerate for at least 4 hours before serving. Cook Time is actually how long to refrigerate until serving. You want to serve this cucumber salad cold. 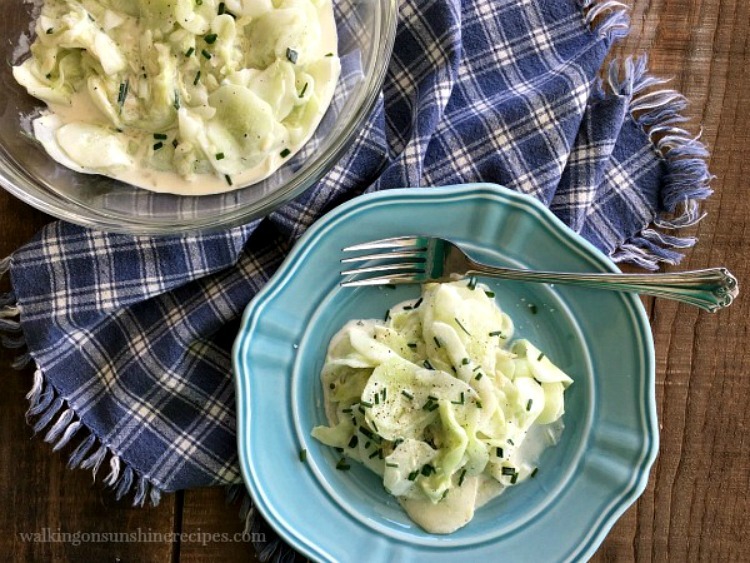 I have never heard of German Cucumber salad before, but it does sound good! Now I am hungry!! Thanks for sharing at home matters linky party. Hope you will join us again next week!! This recipe is a Feature pick at the Merry Monday party this week. Sharing! The new party is open now, stop by! 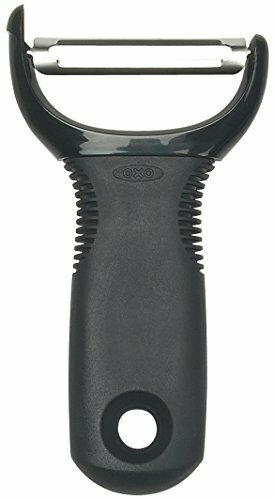 We’ll be watching for you! We grow cucumbers in our back yard so this would be a great recipe to make. Thanks! Thank you Mary! I love this recipe because it reminds me so much of my grandmother’s recipe. Thanks for visiting!